Getting Information About LASIK Vision Correction Has Never Been Easier. The Campbell Cunningham Laser Center makes it easy for you to get in touch with us, whether you need to schedule a consultation or want to get questions answered on YOUR time. In fact, there are at least six ways to get quick answers and learn all you need about this incredible procedure. Free Consultation: We offer free consultations to anyone wanting to know more about LASIK vision correction. An appointment can be scheduled at your convenience. To schedule your free consultation, call (865) 588-3937 or simply click here. “Am I A Candidate?” Form: Considering LASIK vision correction but are not quite ready to schedule a consultation? Find out if you are a candidate for this procedure. Simply complete our “Am I A Candidate” form, and our staff will respond promptly to let you know if your eyes appear to be suitable for this life-changing procedure. There’s no obligation, and you’ll be able to see if LASIK vision correction can fit into your future plans. 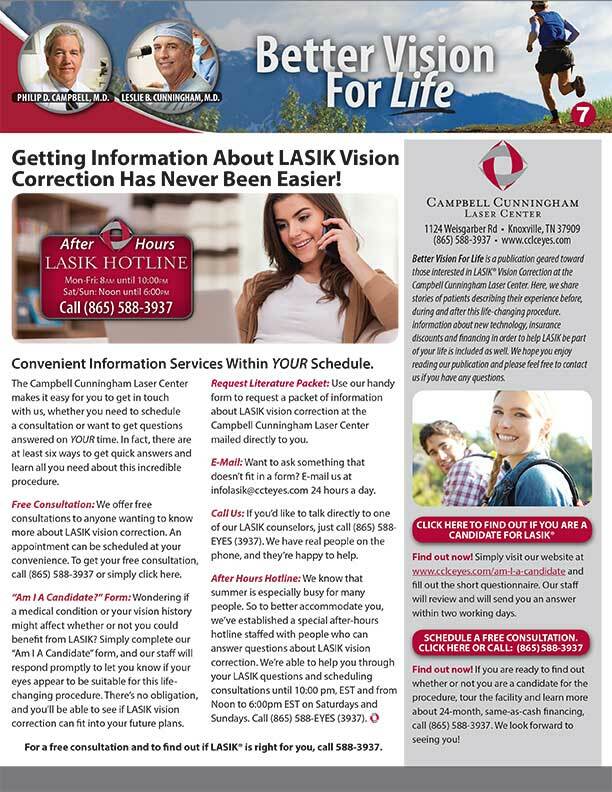 Request Literature Packet: Use our handy contact form online to request a packet of information about LASIK vision correction at the Campbell Cunningham Laser Center mailed directly to you. E-Mail: Want to ask something that doesn’t fit in a form? E-mail us at infolasik@ccteyes.com 24 hours a day. Call Us: If you’d like to talk directly to one of our LASIK counselors, just call (865) 588-EYES (3937). We have real people on the phone, and they’re happy to help. After Hours Hotline: We know that life is especially busy for many people. So to better accommodate you, we’ve established a special after-hours hotline staffed with people who can answer questions about LASIK vision correction. We’re able to help you through your LASIK questions and scheduling consultations until 10:00 pm, EST and from Noon to 6:00pm EST on Saturdays and Sundays. Call (865) 588-EYES (3937). For a free consultation and to find out if LASIK® is right for you, call 588-3937.